At our experienced Bayonne NJ dentist office we understand that different patients have different dental implants needs. In fact, some patients require fully personalized dental implants. As such, dental implants cost tend to varies from one patient to another. The price of dental implants is determined by several factors. The position of your missing teeth will determine the cost of your implants. Any missing tooth can be replaced with an implant as long as the jawbone of the patient is strong. Nevertheless, the positions of the missing teeth that require replacement vary among patients and this causes a variation in the cost of dental implants. For instance, front teeth require more expertise and effort to replace than molars. While replacing front teeth, a dentist has to be extra careful to ensure that the patient’s look is not affected by the procedure. This causes an increase in the cost of dental implants. The dental practice or clinic where you go for the implants procedure will influence the price of this procedure. Different dental clinics charge varying prices to perform this dental procedure. It is important that you choose a reputable dental practice that offers quality, affordable dental implants. For instance, Dr. Gabe Doria dental practice in Bayonne, New Jersey in Hudson County charges the most reasonable price for quality dental implants. With such a practice, you can have your implants done professionally and safely without spending a fortune. The type of the materials used in the implants influence the price of this procedure. Different materials can be used to make dental implants. They include titanium and ceramic among others. The overall cost of the procedure is largely influenced by the chosen constituent material. Different patients require different pre- and post-procedural care. For instance, if you are suffering from a gum infection or periodontal disease, it has to be treated first before you have dental implants. This will affect the cost of your dental implants. Additionally, if you need bone graft to support implants and crown, you will spend more money on the implants. Dental implants placement is an invasive dental procedure. This means that to perform this procedure, a dentist has to go inside the gums via a living tissue that harbors blood vessels and nerves. Thus, the procedure has to be performed very carefully. Great skills are required to ensure that implants are placed in a place where they have adequate support without damaging the surrounding tissues. Few millimeters can be the difference-maker between failure and success of the procedure. Failure of a dental implants procedure can be quite devastating. Dental implants are posts that serve as the teeth roots which hold crowns in place. They can cost more than $1500. That’s why you should have your dental implants placed in a reputable dental clinic. 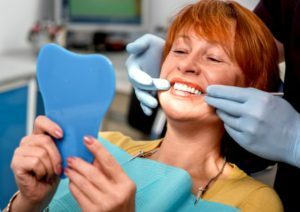 Is the cost of dental implants worthwhile? Dental implants’ value depends on how much value our health has. Since dental implants are capable of lasting a lifetime, they are a better option than major appliances, cars and designer handbags. We might not think about our body parts in terms of the money we spend on them since they are priceless. Thinking about implants in terms of their lifetime aesthetics and functionality importance puts their actual value into perspective. The number of insurance companies that are beginning to realize the benefits of dental implants and covering their cost is increasing by the day. Insurance companies can cover the price of crowns that are attached to the dental implants. 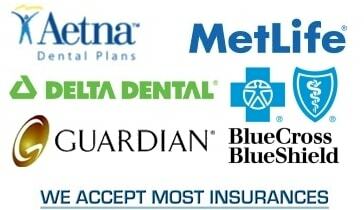 To enable our patients to enjoy a cost-effective care, we work with different insurance companies. We also provide CareCredit to patients in need of financial aid. To determine whether dental implants are the best option for you, schedule a free consultation with us. We give you an opportunity to meet Dr. Gabe Doria’s experienced dental implant staff so that you can feel comfortable having known whether implants will solve your dental problem. Our dentist office in Bayonne, New Jersey in Hudson County gives you the best dental care at the most reasonable price possible. Don’t let your missing teeth continue to ruin your look and smile or cause severe bone atrophy problem or even worse, a permanent change in the way you speak and smile. Call us or visit our Bayonne New Jersey dentist office today to find out more about our affordable dental implants.